Until a few minutes ago, this Sunday morning looked gray to me. Even the fact that we managed to make it to our favorite coffee shop for a coffee and tea fix before heading to church didn’t lift the gray feelings. 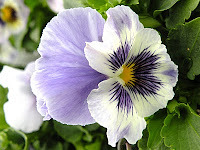 Your pansy photos make it so cheerful and happy on a gray morning here. I have loved pansies since i saw Alice in Wonderland as a child and there were pansies with faces. A coloring book someone gave me later with those pansy faces was a prized possession. I still love them but have no luck growing them. I just enjoy everyone else's. Like Sandra (another commenter on Ginny’s site), I first retreated into the world of books as a child. Mine was a happy childhood with loads of cousins. But for various reasons, I just felt I never measured up. Your verse today reminds me of the week in 3rd grade when I realized that I could never "measure up" on my own. At that age I realized that there was a hole in me that only God could heal. The road has not always been pansies since then. I had and have a lot of growing to do. But when I peel everything away, I can hold fast, give thanks and rejoice in the fact that only God can give me complete, unconditional acceptance and intimacy of spirit. Thanks for the reminder. "O Lord, you have searched me and you know me. You know when I sit and when I rise; you perceive my thoughts from afar. You discern my going out and my lying down; you are familiar with all my ways. Before a word is on my tongue, you know it completely, O Lord." And wouldn’t you know, as soon as I got to the caboose on that train of thought, I noticed the sunshine reflecting off a nearby building. Gray day no more, and in less than an hour we will be celebrating that fact with fellow believers at Grace Church Gulf Coast. NOTE: Pansy photo borrowed from Let Your Light Shine. PS Pansies do have faces. Thank you. Thank you so much for all your kind words, I just feel warm and fuzzy all over now!!! What a wonderful surprise!!! Like you, I have trouble growing pansies, too. They are a cold weather plant, and friends say it is easy, just put them out in the early fall, but ours always die. I, also, retreated into the world of books growing up. My mom was always getting on me about bringing a book to the dinner table and reading it while I ate. But I felt naked without one! Do you live very close to your MIL? What a blessing it is to have her in your family, please give her a big HAPPY BIRTHDAY from me!! I think you are waiting for spring as much as I am!